I took a pair of scissors to the bag, clipping the stray "silk" strands and vacuuming the bag and the table as I went along. I like it much better now (you can see the old hairy closeups here). I can even see the garter ridges, and the pattern itself. You can see a bit of "before & after" action-- I hadn't taken the scissors to the bag strap yet, just the panel. I really like the pattern from JustOneMoreRow.com -- its really smart. I'd like to knit this again in some orange banana silk, or something. I don't even like bags :) It is a quick knit (even though it took me months to complete! ), and uses short rows without wraps (I just can't hang with short row wraps). I followed the pattern exactly as written without any trouble, though the strap my be a few ridges longer than written, I lost track. I did use a US 10.5 needle to pick up and bind off the bag's edges though-- trying to bind off loosely in sari silk is hard and when I did it the 1st one on the US 8's I used for the body and strap, the panel edge was way too tight and curled inward. This sari silk, like I said... not feeling the love. It isn't super twisty like some, it didn't shed, only about one break in the yarn per ball (not in the same color sequence, but who cares for this type of yarn)... but the hairiness is just a big turnoff. I hate that I had to take a pair of scissors to it. It was a good deal though ($18 on sale), and cleaned up well. 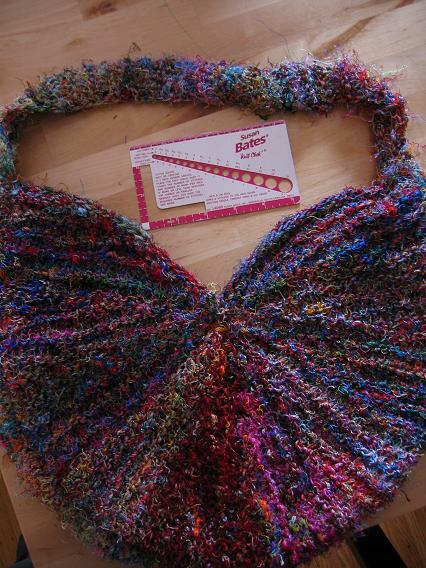 Another "brand" from another vendor would be my first choice for knitting this pattern in sari silk, though. I decided to follow all yalls sage advice and not use an iron on interfacing. I decided to not line it at all, though I may end up regretting it (I know). I don't plan on carrying anything heavy in it at all-- maybe a book, socks in progress, random toys and baby cups, so I'm not worried that much about the stretch. The design of the pattern also should help alleivate stretching out; the knitting from the nexus instead of a horizontal or vertical base will help that, I'm sure. A very fun pattern. I am knitting cuff down (obviously) so I could put on a fold over picot edge on top... loving that on top of the yarn and how there's a secret stripe on the inside of the leg where the edge was folded over. You should save the silk trimmings til next spring and put them out for nesting birds. Love the new socks you started. They say summer. Wow, shaving it REALLY helped. I like it. Before, it looked too crazy. Your sock is cruising along! What a cool bag! The shape is interesting and I love the colors. The birds would love the shavings. I always laugh when I see a big pile of dog hair from our brushing sessions incorporated into a bird nest. Looks great! what a fun bag. Love the color of the socks...reminds me of orange push ups. I really like the edge on those socks. Very dainty and summery! Your bag does look fabulous now without all the "fur." The suggestions made to leave the yarn for the birds is great! Little nests of sari silk next spring--I think we know who the "cool" birds are gonna be! WOW! You're a quick knitter. The sock looks great, and I like the shaved bag better. Bag looks much better shaved, definitely. You're like me and don't carry much in a bag except some knitting and child goodies! Yeah - you should save the shavings for the birds, it'd make for very funky nests! Love the sock you started. I think I will start a sock for myself tonight. I'm having withdrawal. Been knitting cotton dishcloths for the store for the past few days. It's getting a little dull. The bag looks great. I'd never thought of trimming sari silk to make it cleaner. The sock looks good, too. It reminds me that I haven't knit a sock in about 2 months. I should cast some on soon. What a beautiful bag!! And your socks remind me of orange creamsicles. the bag is absolutely gorgeous, i bet you'll get all kinds of compliments the first time you use it. I love that sari silk bag! The bag turned out great, much better after the shaving. Not only did you get a start on those socks, but you've gotten quite a lot done, really cute! Great bag! Love the trim job too, looks less, um, over-grown hippie. 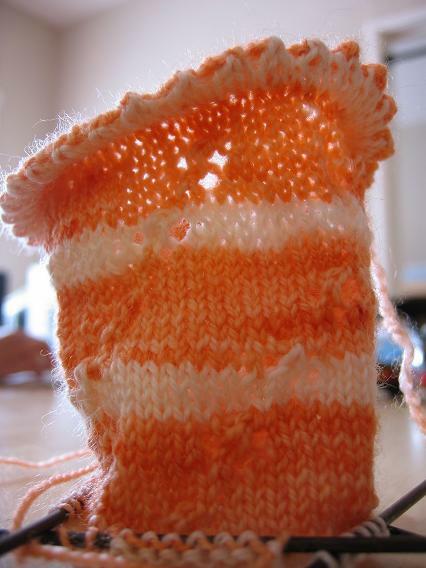 :-) I had no doubt that you were going to really start those peach socks right away - knit on! Really nice bag! I like it better with the ends shaved off too. Nice job on the bag! It cleaned up really well! Hehe, you were right, you are going full force on your sock! Looks yummy!!! I love your blog, it's one of my favourites! And I just saw your pattern in the summer knitty and I'm in love with it...yay! I love the bag. 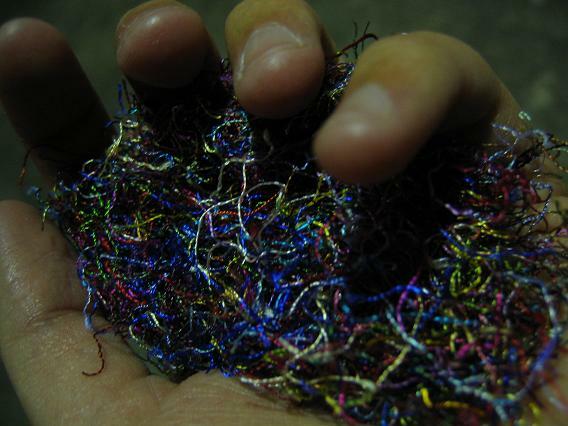 I have 2 skeins of Sari silk. It looks like the large one takes 3, do any take 2? The site didn't say. I think it's a great pattern for the sikl. The socks you got published are awesome by the way.